In the Countenance of Kings, part of Director’s Choice at Pacific Northwest Ballet, is pure joy. And there’s only one weekend left to see it. 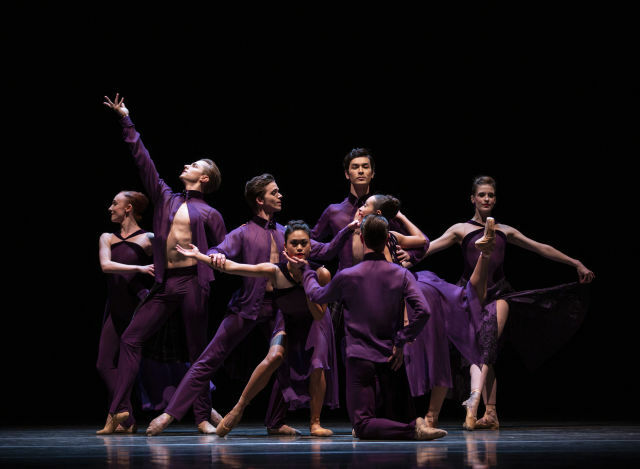 Pacific Northwest Ballet company dancers in Justin Peck's In the Countenance of Kings, featuring music from Sufjan Stevens. Just as spring arrives to coax new life from the soil, as drivers queue up around car washes the first weekend north of 60 degrees, Pacific Northwest Ballet’s annual mixed bill refreshes the senses. And, with the PNB premiere of the Sufjan Stevens–scored In the Countenance of Kings, it left this audience member jacked up on joy like some idealist teenager. To understand the tenor of this year’s Director’s Choice, featuring a trio of PNB premieres from three exciting choreographers, know this: When the curtains rise on the first performance, the dancers are mid-leap—as if already partying back there. And in Bacchus, choreographed by Matthew Neenan, it is, well, a bacchanal. Revelry abounds in the piece named for the Roman god of boozing. The costumes of merlot-colored velvet by Mark Zappone, with sharp strips cut from torsos and fabric dangling freely at the waist, blur gender lines. As do the dancers, pairing off with one another freely and flirtatiously to the lively strings of Oliver Davis’s music. Its seven parts breeze by, a lovingly composed little morsel containing many of the flavors and emotional beats of a story ballet. Pacific Northwest Ballet company dancers in Matthew Neenan’s Bacchus. And yet the headliner cranks up the energy in such beatific fashion that joy defines the night. In the Countenance of Kings, by 31-year-old Justin Peck, features a score from pop luminary/weirdo Sufjan Stevens. While some familiar with his music may roll their eyes at the phrase “Sufjan Stevens ballet,” Peck’s interpretation celebrates the musician’s playfully ornate stylings without approaching twee Wes Anderson territory. With orchestral movements from Stevens’s The BQE, Peck follows the music step-for-step, using repetition and layering to swell moments into bright crescendos that repeat again and again, each more sweeping than the last. And when Stevens offers up a little fluttering trumpet (as he is wont to do), a dancer pulls away to take on the sound and personalize it. Here, corps de ballet dancers like Cecilia Iliesiu, Madison Taylor, and Dammiel Cruz get moments to shine, with a real coming out night for newly promoted soloist Elle Macy—so precise and so fun. We even get charismatic turns out of the often handsomely stoic principal dancer Jerome Tisserand. What Peck really pulls from Stevens is a powerful optimism—a sense of archetypal youth. The smiling faces, the athletic figures in clean attire that vaguely evokes the Olympic games, all following their own stories on stage but stronger when moving, lifting, expressing together—as a society! The young generation has arrived and is ready to save the rest of us.